Yuly Meytus. 12 Children Pieces for Piano. 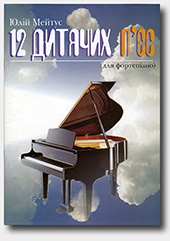 The pieces in this music book are composed for Piano. are possible to be played on free bass Bayan or Accordion as well. This will broaden your repertoire and enrich your performance skills. Pieces are very picturesque, with reach harmonies, melodies, rhythms. They are fit to played by pupils of accordion with average level. Audience - from children to grown-ups.